A well designed and manufactured golf bag is a must no matter what level of skill a golfer has and the Datrek F-15 Cart Bag is worth considering should you need a new bag. The F-15 first of all is lightweight (only 6 ½ pounds) with soft grip handles to make in and out of a car trunk easy and the design includes 15 club slots plus a large putter well. 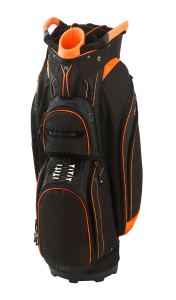 The F-15 is made of heavy duty nylon fabric and the club slots have full-length individual dividers plus there are 10 pockets, each of which can be reached while the bag is strapped to a golf cart. In addition to the more or less standard ball pocket, fleece-lined valuable pocket and apparel pockets there’s an insulated cooler pocket plus a fleece-lined pocket with waterproof zipper. The black body color is complemented by your choice of five accent colors: orange, royal, silver, lime green and red. The F-15 cart bag has a street price of $180.